Following up a massive hit like "Standing Outside A Telephone Booth With Money In My Hands" can be quite the task, especially if you follow-up the song with a second album nearly four years later. In commercial business talk that can be a lifetime. 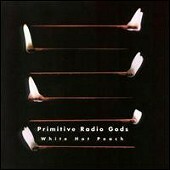 And though the Primitive Radio Gods may not find themselves repeating the success of their last album with White Hot Peach, their latest on What Are Records?, they do deliver an album worthy of commercial success. Dreamy and sensual, White Hot Peach is an album that will get you excited about music again. Warm, refreshing pop flows gently with scratchy beats and a light electronica feel, while a variety of instrumentation fills out the sound, delivering a punchy, riveting soundtrack to good times, sleepless nights, and warm summer eve's with friends and loved ones. White Hot Peach is not merely an almost forgotten album that some suit decided wasn't commercially viable. It is a strong representation of why independent music is needed more than ever, as well as a testament to the sorry state of commercial rock. If only the mindless masses choose music like this over Limp Bizkit and Three Doors down... if only... I'll give it an A.